MOSCOW, Russia, November 19, 2010 (ENS) – Days before the opening of its historic International Tiger Conservation Forum, the Russian government has moved to preserve key Amur tiger habitats by banning the logging of Korean pine. The tree species is included in a new version of the list of tree and shrub species prohibited for timber logging. The endangered Amur tiger, numbering fewer than 500 in the wild, lives in southeastern Russia and northern China. WWF-Russia included the Korean pine ban in the list of top eight measures that must be taken in Russia for tiger conservation, which were presented to the Ministry of natural resources and environment of Russia in the summer. The International Tiger Conservation Forum is the first global conservation meeting to focus on a single species. The four-day forum opens Sunday in St. Petersburg, hosted by Prime Minister Vladimir Putin, who has taken a personal interest in tiger conservation, and backed by head of the World Bank Group Robert Zoellick. The inauguration event was held today at the Vladivostok State University of Economy and Service. Thirty young Tiger Ambassadors were met by students of Primorsky Agriculture Academy and other universities, young environmentalists from local towns, and Primorsky region vice-governor Viktor Myasnik, as well as consular-generals of India and Vietnam. The young delegates will share ideas by videoconference with delegates from tiger range countries in St. Petersburg. Tiger Youth Forum participants today opened the Tiger Trail on Sportivnaya queue in Vladivostok. Constructed by Vladstroiservis Company for WWF, the trial consists of 13 black and rose granite stones, laid out in chess order, each with a tiger track and name of one of the countries, still inhabited by tigers: Bangladesh, Bhutan, Vietnam, India, Indonesia, Cambodia, China, Laos, Malaysia, Myanmar, Nepal, Thailand, and Russia. The governments of these countries have been at work for two years in advance of the St. Petersburg Tiger Conservation Forum, defining their national positions on tiger conservation. Their representatives will sign the St. Petersburg Declaration, affirming their resolve to save wild tigers from extinction. Tiger conservation groups have high hopes that the actions taken and financial pledges made in St. Petersburg will begin to reverse the steep decline of the global tiger populations to about 3,200 from about 100,000 at the turn of the 20th century. Prime Minister Putin will attend in person on the last day of forum. Other heads of state who are scheduled to be there include: Chinese Premier Wen Jiabao, Indian Prime Minister Manmohan Singh, Indonesian President Susilo Bambang Yudhoyono, Nepal’s Prime Minister Madhav Kumar Nepal, and Abhisit Vejjajiva, Prime Minister of the Kingdom of Thailand. All 13 tiger range states will be represented by their ministers of environment, natural resources, forestry or foreign affairs. U.S. Conservation groups were urging U.S. Secretary of State Hillary Clinton to attend, but instead, Under Secretary of State for Democracy and Global Affairs Maria Otero leads the U.S. delegation in St. Petersburg. Under Secretary Otero will also be meeting with civil society groups and Russian government officials. 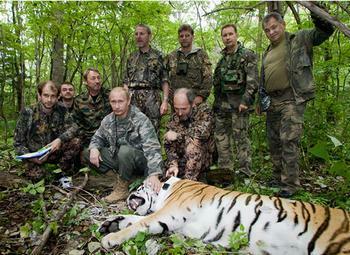 The U.S.-based conservation group Panthera is actually boycotting the tiger summit. Instead of the big picture and landscape-scale conservation the international summit will address, Panthera wants to focus on a small group of 42 protected areas where most tiger breeding occurs, and make sure they are protected from poachers. “While we agree that disparate issues such as educating local people about tigers and employing carbon emission allowances to preserve tiger habitats may help in the future when tiger populations are stabilized, Panthera fundamentally disagrees that there are many pieces of the puzzle when dealing with the immediate reversal of tiger decline,” Hunter said. Barney Long, Tiger Programme manager for WWF US, has been organizing the forum for the past two years. He understands Panthera’s position. “What they are saying about these core areas is absolutely correct,” Long told ENS in an interview.